These units are larger, more powerful, and are structurally designed for exceptional stability -- giving 31' to 46' (9.4m to 14.0m) working heights. They are equipped with patented articulating rear axle and 4-wheel drive to provide up to 40% gradeability to power over and around job site obstacles and debris. 4 wheel drive, articulating rear axles, gas or diesel power, and a large platform with standard roll-out extension make these heavy-duty scissorlifts the right choice for rough terrain applications. 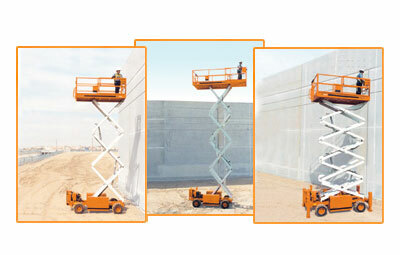 These are rugged, dependable, value-priced workhorses with huge platforms of 84 sq. ft. (7.8 sq. m), gas, dual fuel or diesel engines, and platform capacities up to 1750 lbs (794kg), are available.